Improving access to STEM education and jobs depends in part on rethinking how science is taught in the classroom and how students are introduced to career pathways. CCRI’s Debra Bragg is an external evaluator for an NSF-funded project that supports and encourages faculty to lead that kind of change. In March, she joined the researchers involved in the project to facilitate a session at the Council for the Study of Community Colleges (CSCC) Annual Conference. The CSCC brings together researchers studying community colleges to continue advancing the field and student success. 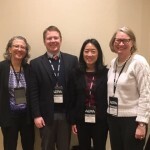 At the San Diego conference, Bragg joined colleagues Pam Eddy, Yi Hau, and Ellen Everson to discuss lessons learned from the Supporting and Advancing Geoscience Education at Two-Year Colleges (SAGE 2YC) Faculty as Change Agents project launched in 2015. SAGE 2YC is a professional development project focused on supporting geoscience faculty in learning and applying strategies that encourage educational and workforce success for a diverse range of students at two-year colleges. You can view the CSCC presentation here and learn more about SAGE 2YC below.